The AptCore ACR1 cores are fully programmable Digital Signal Processor units optimised for radar applications. Using an AptCore ACR1 DSP core reduces the size, power consumption and cost of the radar system. The FFT efficiency is close to 100% as compared to the 30-40% maximum FFT efficiency of standard DSPs. This makes the ACR1 a much smaller and lower power solution. The internal data path allows for highly efficient 2D transpose and bit reverse reorder operations, which can be combined with vector multiply and multiply accumulate operations, giving further performance and efficiency gains. The AptCore ACR1 can be used alongside an industry standard RISC processor as a radar signal processing accelerator. Software development then uses the RISC’s standard toolchain, and employs AptCore’s DSP libraries to access ACR1 functionality. 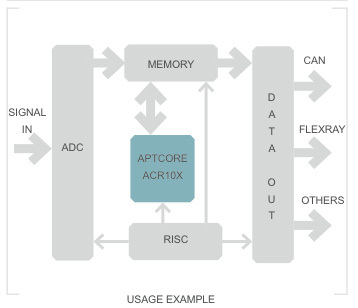 The AptCore ACR1 is controlled using API calls sent over the system bus to a slave interface. Data is transferred to and from internal data memories via a master interface, with a double buffering option to allow the AptCore compute units to operate in parallel with data capture from ADCs. 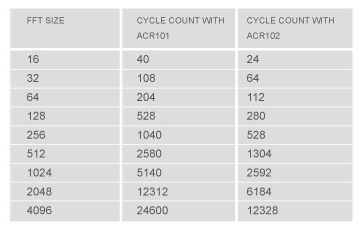 The table below shows the cycle count versus FFT length for ACR101 (single core) and ACR102 (dual core) processors. Clock speed used is dependent on target technology and performance requirements. For higher performance requirements, more cores can be added – please contact us for more information. A radar system captures 256 sweeps of 256 points from two antennas. The samples are processed for range and velocity using a 2D complex Fourier transform. The phase of the detections from each antenna are compared to determine the direction. The cycle counts in the above example are for the ACR102. Peak detection and local averaging can be included in the magnitude operation to accelerate Constant False Alarm Rate (CFAR) detection. Saturation caused by Continuous Wave (CW) interference may be suppressed by the core as the samples are received. ACR1 cores are available NOW. Contact AptCore today for further information.